Should a woman seek bio-identical hormone treatment during menopause? 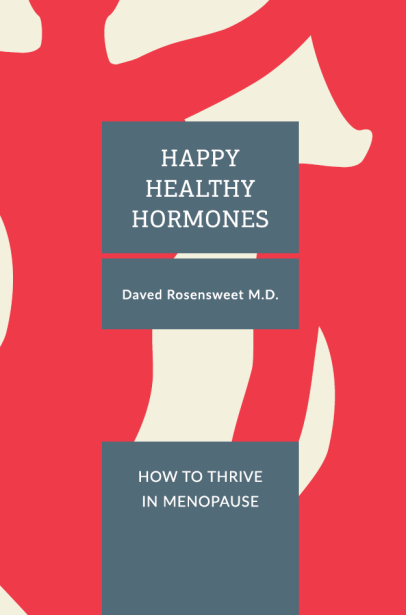 In this book, Dr. Rosensweet explains why the answer to this question is almost always “yes.” Adequate hormones are critical for energy, libido, healthy arteries, cognitive function, and memory. Diminished hormones can lead to weight gain, osteoporosis, sarcopenia (muscle loss), and diminished bladder control. Like any course of treatment, understanding both the benefits and risks of bio-identical hormone therapy is important. What does the medical literature reveal? This book seeks to show that with carefully prescribed bio-identical hormones, there is reduced risk of serious medical diagnoses, including breast cancer, compared with no treatment. Conversely, there is a near certainty of increased health decline without treatment. The benefits go far beyond the reduction of symptoms. Individualization matters. Every woman’s hormonal needs are uniquely her own. Hormones are prepared in a base and that base matters. Most bases contain strong solvents. Organic is healthier. Knowing how to find the right doctor is important. women in menopause with bio-identical hormones (www.menopausemethod.com). He is a pioneer of organic-based hormones and a frequent national lecturer. Dr. Rosensweet was the Principal Investigator for a scientific study of female hormones sponsored by Metametrix Clinical Laboratory (a subsidiary of Genova Diagnostics).